Fencing is one of the most important parts of woodwork. It gives a shape to the backyard as well as helps in separating houses. However, creating a fence can be a tedious task. From selecting the right wood for fence to building it in the backyard to painting it with the right color for fence. Everything needs to be done with perfection otherwise it can ruin the overall look of the fence in minutes and eventually the house. Why a Wood Stain is Required? 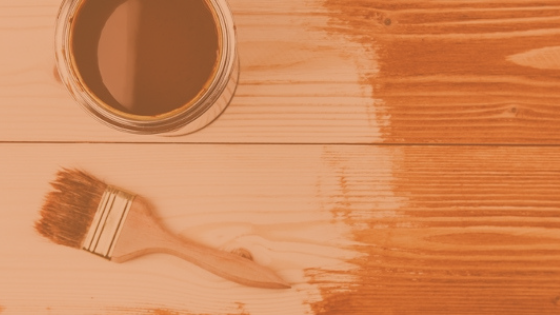 What Are the Types of Wood Stain? How to Stain a Cedar Fence? How to select the right wood? Which woods are commonly used in fencing? Once after determining the site of installation the next step is to select the right type of wood. Wood is selected over other items like steel or aluminum because of its aesthetic value. The fences made out of wood impart a royal touch to the house. Fences can be made from a variety of woods and the right choice of wood depends on many factors like first of all your budget because the price of woods vary with the quality, secondly the resistance provided by the wood because not every wood can be suitable for building a fence. So, fencing may seem an easy task but it asks you to be meticulous while building it. A wood stain basically consists of colorants which are either suspended or dissolved in a suitable vehicle or solvent. Many professional woodworkers believe in using a wood stain to increase the aesthetic value of wood as well as increase its lifespan. A stained wood looks attractive, it provides a finish to the wood and the chances of rotting are comparatively lesser than the unstained ones. A lot of people wonder of the stain getting into the pores of the wood as it can render it harmful. However, it does not hold true. A stain rather protects the wood from insects and rotting. Woods are not uniform in colour. They have light and dark patches which does not look good. A stain gives a uniform colour to the wood thus making it eye catching. Stains can also alter the tone of the wood. For example, you can get rid of the reddish tint of mahogany by staining it with walnut coloured stain. A lot of times multiple woods are employed in creating a fence and it can cause non-uniformity of colour but with a proper stain the problem can be fixed in minutes. You can even the tone of wood in seconds. Insects, Dermites and Fungus are the main culprits behind wood rotting. The wood is continuously exposed to the moisture and humidity which can create a favourable environment for the insects to feed upon. The wood is rather vulnerable to rotting. Rotten wood is dangerous and it has to be replaced immediately. So, better option is to provide it with protection beforehand. A wood stain provides a good protection from insects and dermites. Staining your wood averts the rotting and increase the lifespan of your wood. The basic essence of a wood stain is obviously its colour. Earlier people used to rely on the natural colour of the wood for creating a fence because there was no other option but with a wood stain you can get the colour you desire easily. You can give your wood a colour that does not occur naturally. It does not affect the quality of wood at all but accentuate its lifespan. Even if you wish to preserve the natural colour of wood then transparent wood stains are available which simply give a shine to the wooden surface. The non-uniformity of wooden surface can be resolved in minutes with a wood stain. So, why not give it a chance? Sunlight not only affects humans but also the wood. It tends to damage the wood with prolonged exposure and of course, there are no SPF parameters in case of a wooden fence or furniture. A wood stain is right choice in this matter. It will help in protecting the wood from sunlight and avoid the discolouration caused by it. Fences are constantly in contact with the external environment and so they are prone to be damaged by rains. Water can cause serious damage to the wood. It can create a favourable environment for the insects and fungus to grow as well weaken the wood at the same time. This is exactly where a wood stain works as a boon. It creates a barrier between the wood and water thus making your wood water resistant. The surface of the wood becomes water proof and thus the water slides away easily without causing any damage at all. With so many benefits in one go, why not give your wood stain a chance? Dyes are the oldest form of wood stain. These are basically pigments dissolved in a vehicle. Dyes are generally used to match the existing colour of the wood. You cannot give your wood a different colour with the help of a dye. These are both water based or oil based depending on your choice. Water based dyes are fast drying than the oil based ones. The water based dyes need to be applied with several coats as they do not provide a colour immediately. If your only concern is to protect the wood and maintain its natural colour then dyes are the perfect choice. Oil finishes improve the appearance of wood. It provides a lustre as well as tone the imperfections of the wood. Natural oils present in the wood take some time to dry. So, oil finishes are needed to kept in sunlight for few minutes to dry out the stain entirely. Oil finishes basically replace the natural oil can nourish the wood grain thus providing protection both internally and externally. Varnish are generally clear and transparent. These can be water based, oil based or resinous. Just like oil finishes varnish also takes a while to dry. The additional advantage associated with using a varnish is the UV protection. It protects the wood from sunlight better than any other wood stain available in the market. Varnishes are basically used as a coat over the dyes to protect the wood from sunlight and damage. Lacquers are thinner in consistency than the others and so need to be sprayed than painted. These dry comparatively faster than varnishes and oil finishes. The solvents in the lacquer go deep down into the wood grains and nourish them thus accentuating the beauty of the natural wood. These also impart a lustre to the wood with protection. Shellac is a kind of wax that has been used in multifarious fields since ages. It is also employed as a wood stain because of its consistency. Alcohol is used as a solvent along with shellac for use as a wood stain. It is easy to apply and takes a while to dry. Because of being waxy in nature a gloss is provided by the shellac stain. French polishing dates back to 19th century and it is one of the oldest methods of wood polishing. Just like the shellac coating, a mixture of shellac and alcohol is mixed and a rubbing pad is lubricated with oil. This rubbing pad is then dipped in the shellac-alcohol solution and applied on the wood surface. French polishing is one of the most renowned techniques and provides glossiest finish to the wood. It is quite obvious for you to get confused while choosing for the best wood stain from the numerous of options. You need not to worry anymore because here are some of the best choices for you to consider along with their reviews to make this difficult task wee easy for you. 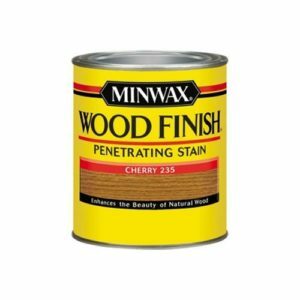 This product from the Minwax is available in 28 colors to choose from. The wide array of tones and hues render it easier to select. 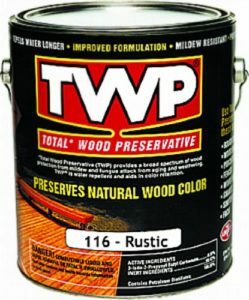 This quality product can be used to add beauty to bare or striped wood surface. As the name suggests, this formula penetrate deep into the wood and nourishes the wood grain. Since many years it has been America’s most favorite and trusted brand amongst all. It is available in 28 colours. The deep penetration provides a nourishment to wood grains. It provides protection both internally and externally. 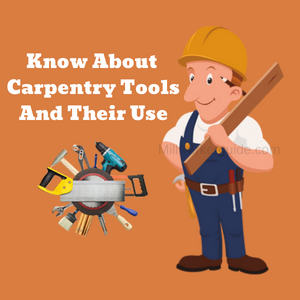 It can be used for variety of purposes from fencing to cabinets, furniture and even hardwood floors. It can eventually turn the wood gray. It requires a sealant to fix the stain. 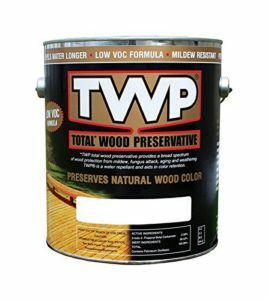 TWP that is, Total Wood Preservative is in itself a “contractor formula” which is especially suitable for a cedar fence. Cedar has a tendency to turn gray after a while and this product prevents it for around 2-3 years. This quality product from the TWP gives a professional look to the fence thus increasing its aesthetic value. Along with protecting the cedar from turning gray, this product also does a great job in protecting it from fungus, insects and dermites. It is suitable especially for cedar fence. It prevents the cedar from turning gray. It provides a long lasting duration of around 2-3 years. Works as an overall preservative. You cannot apply the stain directly to the brand new fence. The wood has to be kept for 4 months before staining. 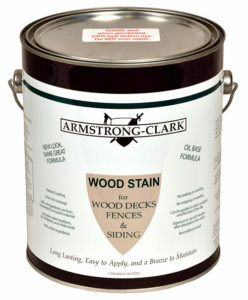 This yet another quality product from the Armstrong is again especially designed for cedar. It is one of the most durable stains and prevents wear, tear and peeling of the wood effectively. Another additional advantage of using this stain is the UV protection. As the cedar wood has a tendency to turn gray due to exposure to the sunlight, this product gives the wood a superior UV protection thus protecting the wood from turning gray. Other stains cannot be applied in direct sunlight but Armstrong do not cause any harm even in broad sunlight. The stain penetrates deep into the wood and keeps the colour for a long time. Long lasting stain with a lifespan of around 2 years. It provides an ultra UV protection which is better than any other wood stain. Especially suitable for cedar fence. The stain can be applied in direct sunlight. None other brands can be used over it. Another stain from the TWP series, the TWP 1500 series is new in town because of the 500 series being not available for most of the consumers. The quality of the product is still the same. It accentuates the colour and quality of the cedar fence by penetrating deep into the wood. It also provides a lifespan of 2 years and provides protection against mold, mildew and algae. It prevents wearing and tearing of wood. It improves the quality of the cedar. Prevents it from turning gray. The very first, basic and yet most important part is to examine the wood closely. Examining the wood involves looking for nails, screws or broken fence pieces. These minute things are needed to be removed immediately for a smooth surface of the fence. Sand down the rough areas before applying the stain. The key is to even out the surface completely. Do not be in haste and take time to even the surface. Cleaning the wood is the second most important thing to do. Apply a good wood cleaner and that will also ensure the smooth surface of the wood. Make sure that you follow the instructions written on the wood cleaner before going for it. Apply the wood cleaner on the wood surface and clean with the help of a brush or a mop to scrub the debris and dust away. Let the wood fence completely after cleaning. And so finally! The step you have been prepping for. The wood is ready to be stained after it is scrubed, cleaned and dried properly. Keep the brushes with you or a roller or spray in case of lacquers. The key is to apply every coat evenly. Do not turn the directions of the brush as it may look uneven on drying. The different strokes appear unattractive on drying. In case if you notice that the surface blotchy then quickly even the surface with the help of a brush. Avoid formation of stain puddles on the surface. This is also a mandatory step in staining. You have to let the fence rest after every coat. Do not be in hurry or check the fence with your fingertips again and again for it will leave a cast on the fence which will not look good after drying. The wood will usually take around 24-48 hours to dry. So, be patient and leave the fence for a day before reapplying a coat. The base coat has to be the most perfect. So, finally all your labor has worked wonders and it is the time to enjoy your own created fence. You can sit and relax. However, make sure that you properly maintain it. Stain it once every year and clean it once or twice a week. This will increase the lifespan of the wood. Cedar has a tendency to turn gray with time. So, make sure that you notice changes in the wood. Apply the stain again if you notice any grayish hue on the wood. The woods are available in many varieties depending on the type of work. The woods generally used are premium grade or clear grade woods. These impart a uniform appearance to the fence as well as are durable at the same time. The only drawback associated with both of these woods is their price because these are little expensive and it can cause a burden on your pockets. The construction grade of wood can also be considered for building a fence because these are comparatively cheaper than the premium and clear grade ones. However, it may provide lesser resistance than the former. Generally, only six types of woods are considered for fencing that is, Pine, Fir, Spruce, Cedar, Cypress and Redwood. The Pine, Fir, and Spruce are usually employed because of them being cheap and durable at the same time. Spruce is used in constructing picket or stockade-style of fences. Pine and Fir are pressure treated woods. These are treated with insecticide to provide resistance from termites and insects. Redwood is the most expensive woods out of the six types of woods employed for fencing. The price renders it rather uneconomical but because of its high aesthetic value, it has been in use since ages. Cedar and Cypress are one of the best options for creating a fence. These contain natural oils which prevent the rotting of wood by keeping the insects off. These are naturally insect resistant thus a longer lifespan is served by them. However, Cypress can be a little hard to find and expensive because of it being a native of South America but Cedar can be found easily and will not go hard on your budget. 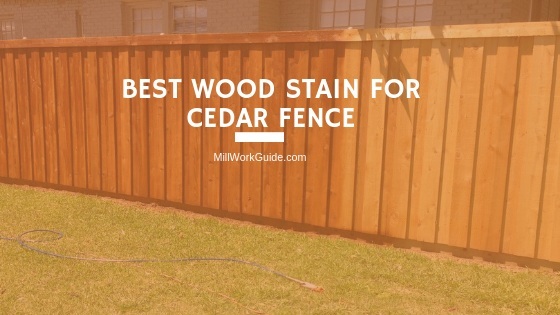 If you are considering building a fence from scratch and looking for a durable, water resistant, insect resistant and affordable wood then cedar would be the right choice for you. It should be stained with proper tint and hues to prevent it from turning gray. It is quite obvious for you to get confused while choosing for the best wood stain from the numerous of options. You need not to worry anymore because here are some of the best choices for you to consider along with their reviews to make this difficult task were easy for you.